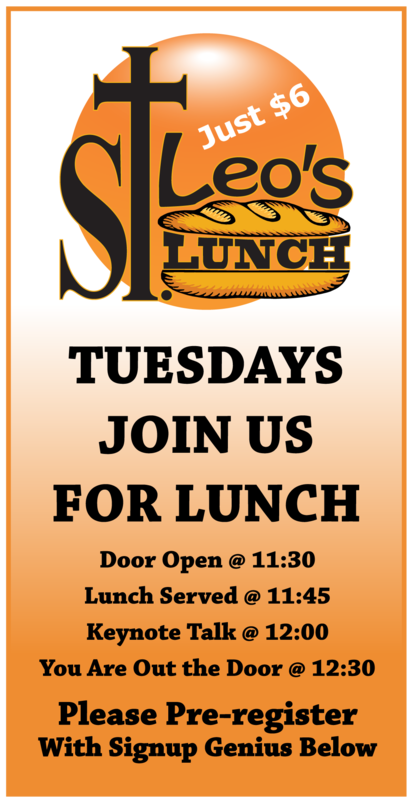 Through the conversations of local men, who were seeking opportunities that would draw men together in a positive spiritual atmosphere, the St. Leo’s Lunch was created. A weekly luncheon for men, for a simple $6, the event is held on Tuesdays. Hosted at St. Louis Catholic Church, lunch is provided by local restaurants in the Memphis, TN area. The keynotes are given by guest speakers, on topics of faith and spirituality. The talks cover traditions and dogma of the Catholic faith, with an emphasis on men’s role as husband and-or leader. This rich environment of positive information, along with the strong presence of good Christian men, is a door to be opened and all men are invited.